A Pier That's Easy in & Easy Out ! Leisure hours at your waterfront home are precious. Why waste them repairing, painting, installing or removing a back breaking, old cumbersome pier? A new carefree Atlas Piers will end your pier maintenance and installation problems. 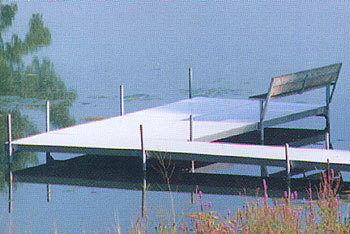 This durable, lightweight, Atlas Piers will add to the appearance, value and enjoyment of your waterfront home. 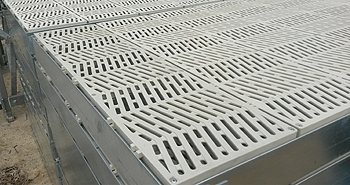 The modular design makes your pier configuration virtually unlimited. Let Atlas Piers enhance the beauty of your waterfront home with minimum investment. for your lake or river frontage. An Atlas Pier goes in fast and easy. The interchangeable modular sections are easy to handle - each section weight less than 100 lbs. With few working pieces, installing an Atlas Pier requires minimum effort. The two step process (cross pieces and deck sections) and the single galvanized steel 3/4" bolt fror height adjustment contrasts favorably with many other piers which require a hardware store's supply of nuts and bolts. Atlas Piers has it all! Strong construction and a unique design that delivers outstanding load capacity, functionality, and superior safety.